Your expired credit cards can be put to other uses around the house. 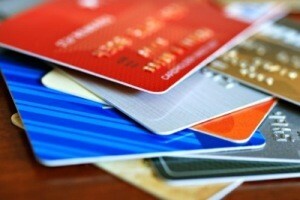 This is a guide about cleaning uses for old credit cards. My Corning stove top always gets dirty when I cook on it and have overspill. I first use some Soft Scrub, then I take an old credit card and scrape it clean. Last, I wipe it with a soft cloth, and I have a clean stove. No trouble at all. Uses for "fake" credit cards that come with credit card offers. Post your own ideas. The fake charge card cards that are sent attached to a credit application are great for use in spreading glue, particularly with wood projects. It also help scrape clean the excess glue squeezed out when putting two pieces of wood together. Not to mention they make a handy dandy emergency window scraper conveniently thrown in the glove compartment of your car. They're also perfect for scraping pans before washing them, especially if the pan has sat with hot water in it (or cold, depending on what's in the pan). They don't scratch, and they work really well! When my old AAA cards and such expire, I just put the cards in the drawer under my sink and use them when the one I'm using gets damaged; however, it's very hard to damage them, so I have quite a few backups. I've been getting quite a few credit card application junk mail which come with a copy cat credit card which is not really a legitimate credit card. Some of them have magnetic backs, so I've been making magnet stickers out of them. They're fun to make and you can put whatever you want on them! You could also give them to your young children who like to play store. Make sure they also have play money so they can learn to do figures. They could also be bookmarks. You could use them to clean combs. They can be used as a letter opener. I just tried it out. Can be used to wrap string, small amounts of fishing line, or put an amount of rubber bands and paper clips on then to take along in a suitcase or briefcase. How about a small Fake Credit card mobile around you desk to keep reminding you to stay out of debt? For you artists, consider fusing them together somehow to make a statement and maybe quite a few bucks? You could use them to either cut or tuck wall paper in the corners. Use them for a type of sound effect and if you are that good, a musical instrument. Run it over differant surfaces and hear the different sounds it makes. Stick it just a little inside of different types of closed drawers and flick it hear the differant sounds. That is about all I can think off right now. You try! I use an old credit card to clean the algae off of the front of the aquarium. Also, I took a watercolor class where the instructor used an old credit card like a squeegee to move paint around. I use old credit cards as kitchen bench food scrapers. I find that they get off all food scraps easily. This means you save money on kitchen sponges, and the bench top doesn't get scratched. Use an expired credit card as a scraper while washing dishes. It easily removes stuck on food without marking the dish or pan. I also use the no-name promotional cards that I get in the mail from the credit card companies. As long as they're plastic, they will work. What a great idea! I will have to remember to do that. They also work great for scraping gum off floors, dried glue, hardened candies etc. You can also punch holes in them and use them as large key tabs for kids, zipper pulls, luggage tags etc. With a little sanding, they are also easily paintable. Don't throw away your outdated credit card. I use it to clean my kitchen counter, especially after making some thing like pie crust. The dough sticks to the counter top and if you take the side of the credit card it really removes any hardened dough (or anything else) very easily. The promotional information that is mailed to you for you sign up for a new credit card sometimes contains a mock plastic card in the envelope. Don't throw it away. I find that it works wonders on scraping pots and pans with little effort and without harming the pots and pans. Great tip! I also give those "fake" credit cards to my kids to play with. I'll tell them that they got some mail. They feel like big shots. They have a play store and they use them with that.